The Great Orme headland is a huge chunk of limestone rising from the sea. The name, given to it by the Vikings, means “sea monster”. The Great Orme has been designated as a Country Park, Special Area of Conservation, Site of Special Scientific Interest and Heritage Coast. There are houses on the Orme but it’s most famous residents are the wild Kashmir goats with their shaggy white coats and fearsome horns. There are many things to see and do on the Orme. To get to the top you can take the Great Orme Tramway or the Cablecar, there are also many paths to follow if you would like to walk the 207 m/679 ft to the top, or you can drive. Once at the top you can follow the nature trail from the Great Orme Country Park Visitor Centre. Visit the Great Orme Mines and walk through tunnels mined out over 3,500 years ago. Or, if you would like something more energetic, visit the Llandudno Ski Centre on the slopes of the Great Orme. Situated 415 ft above sea level and offering spectacular views of Llandudno and the surrounding area you can ski, snowboard, toboggan and sno-tube. Whatever your interest the Great Orme has something for everyone. Llandudno Bay sweeps majestically in a crescent between the Great Orme at one end and the Little Orme at the other. The Victorian Promenade which runs alongside is perfect for a stroll along the sea side. Along the Promenade is Venue Cymru, our local theatre, which plays host to West End plays and musicals and stand-up comedians. As you near the Pier you may recognise the “voices” of Punch and Judy. The show is always a firm favourite with children of all ages. The Victorian Pier has Grade II listed status and dates back to the late 1800’s. It is a traditional seaside pier with shops, cafes, bars and attractions offering fun for all the family. Near the Little Orme is Bodafon Farm Park which has farm animals such as cows, sheep, pigs, geese, ducks, goats, horses with more unusual animals including llamas, red and fallow deer and highland cattle. 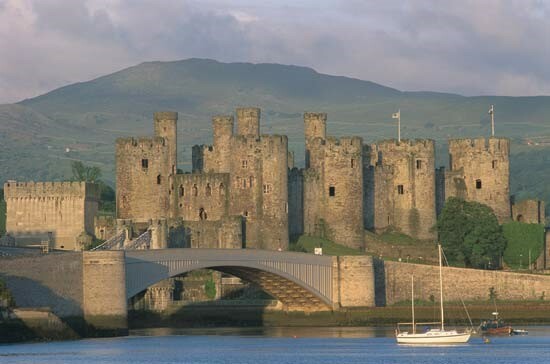 Visit nearby Conwy with its imposing Castle, built for Edward I between 1277 and 1307. Walk along the walls which surround the town and were built to keep the Welsh out. There are spectacular views but you need a head for heights. If you want to travel further afield there is the whole of Snowdonia to explore. And then there is always the golf!! !